Massimiliano Russo was born in Lecce, Italy, on 28 September 1976. He graduated at University of Lecce in Materials Engineering, biomedical field, in 2005 with the thesis "Molecular engineering utilization of innovative Pt(II) complexes in substituted porphyrins" about deposition and characterization of thin organic films and coatings on different solid supports. 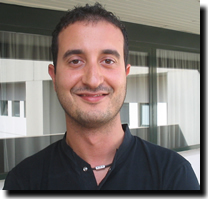 Since 2006 he collaborates into biomaterials laboratory at the University of Lecce. Actually engaged for the research and development of superabsorbent hydrogel for different applications as biomedical, textile and agriculture of arid lands. Also engaged for the development of new technical antibacterial fibres obtained by deposition of silver nanocluster on natural or synthetic supports. Experienced in the use of thermogravimetric analyses (TGA), in the valuation of superabsorbent hydrogel swelling ratio and in the execution and analyses of antibacterial tests.